Spring is almost here and I am so excited! Not only is the weather starting to warm up a little bit, but now is the best time to begin starting your garden for the year. I will be the first to admit that gardening was never something I figured myself to do. 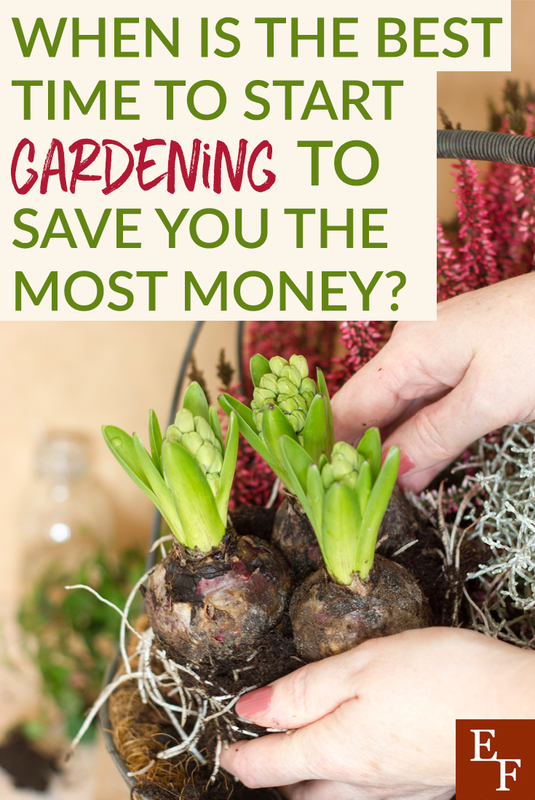 But, as we have ventured further down the path towards financial independence, gardening is just one of those things that makes natural sense to help us save more money. Here are some great reasons why starting a garden, and starting it now, can help save you more money! Growing your own food can end up saving you a ton of money on groceries if you do it right. Of course, gardening takes some hard work (especially at first) to really reap the rewards. So you have to be willing to put in some sweat equity to get the most bang for your buck. Whether you have a large space to garden, or only a small patio or deck, there is a multitude of ways to make your space work for you. Even though we have a large back yard, we have found that planting a lot of our crops in planter boxes works better for us. It helps reduce the number of weeds and pests, and it is easier for us to control when the weather swings wildly, as it does here in NC. According to a report by the National Gardening Association (NGA), 54% of households that started their own gardens did so to save money on food costs. This report was in 2014 though, so I am sure the number is actually higher than that now. According to multiple different gardening sites and surveys, the amount that a household can save varies widely. For the most part, having your own home garden can save you between $500 – $1000 per year. However, this will be based on where you live, your family size and how many different crops you grow. I know for us, as a family of 7, just the small amount of crops we were able to plant (and get successful yield from) last year saved us at least $600. We are really excited to see how much more we can save this year by expanding our garden to include more diverse crops. One of the most expensive parts of starting your own garden can be the seeds. There are so many different choices now, which is great! And so many heirloom varieties of previously homogenized crops are now on the market, which can really help your soil health. But, seeds can get expensive also. We only purchase organic seeds, since we want all of the crops we grow to be organic from beginning to end. Since everybody has different desires though, this may not be for you, and that is perfectly fine. But for us, it is important and we are willing to pay more for it. We prefer to plant perennial crops because I am not a huge fan of having to do the same work over and over again. It is hard enough work to keep the beds weeded and the pests away. But some seeds are bred to be annuals, so you may not have a choice, depending on what you want to grow and which type of seeds you get. These are all things to keep in mind when you are seed shopping. When seeds first begin to sprout they are as delicate as an infant, and susceptible to all sorts of demise. So, whenever possible, it is best to start seeds indoors in order to control as many of the variables as you can. This can help ensure the long term success of your crops. At least until transplantation to the outdoors, when Mother Nature will do what she does. Your crops become less controllable once you transplant them. So the stronger you can get your sprouts before you transplant them, the better. If you want to know which crops are best for your area, and when to start them indoors (NOW! ), The Old Farmer’s Almanac is a great resource. Once the weather is indicated to be correct for outdoor transplantation, then comes the fun part! Really, it is the trickiest part because Mother Nature just does what she wants and most things are completely out of your control. There are so many things that you wouldn’t necessarily even think of when transplanting seedlings to their new permanent environment, it can make your head spin. But, The Old Farmer’s Almanac has been used for centuries now for a reason. They are the experts at everything farming, including your own garden, and transplanting seedlings for overall long term success is no different. I realize this is a lot, but once you get the hang of it, it can be fairly easy. When you first embark upon this journey, it may seem overwhelming, but it does get easier. And it is so rewarding to be able to go outside and pick your own fresh food for a meal and not have to pay anything for it. You will not only save money on groceries, but also the gas, and wear and tear on your vehicle. If this isn’t a win, I don’t know what is! Have you started your garden yet? If so, how much have you been able to save on groceries so far?